Yesterday, I was at the J-Pop festival in SF Japantown, where I ran into a caravan of food trucks. Among the offerings was the Candybar Dessert Truck, which offered a selection of ice cream sandwiches. Purely in the interest of research, I ordered one. Candybar's innovation is to use giant macaroon cookies, in different flavors, to pair with different ice crema combinations. 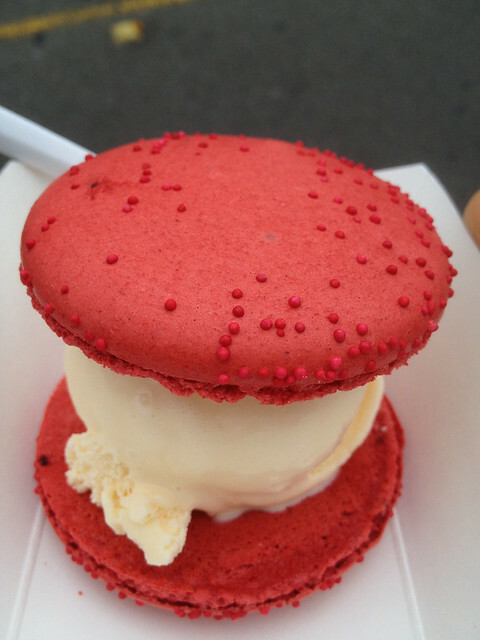 I had the red velvet macaron cookie with vanilla ice cream, for $5. You're enjoyment of this version will depend on your feelings toward macarons, which has a strong meringue flavor and a crispy sugar crust. I'm pretty "meh" toward macarons in general, and didn't like the meringue flavor getting in the way of the red velvet. But I will say that the cookie was well made, large, and dense enough to serve as a firm platform for the ice cream. That said, it actually did not work as a sandwich. I couldn't really get my hands on it to eat it properly. Which I guess is why they give you the spoon and serve it on a paper plate. They might as well have served the cookies on the side. An interesting variation, but I won't be rushing to have this again.